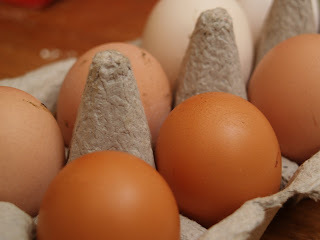 Our hens are laying well at the moment - spring is definately in the air! 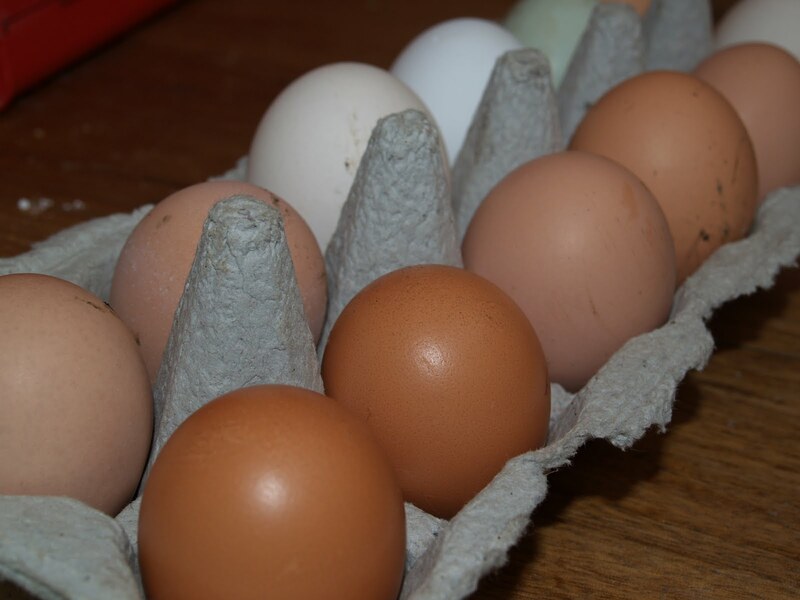 We have been enjoying an abundance of fresh eggs, real eggs, laid by hens who actually spend their day roaming around our land, doing what they like (and laying eggs wherever they please too!). Our eggs come in all shapes, colours and sizes. Its my 'thing' to try and breed a flock of hens that will lay eggs of all different colours, I particularly proud of one of my 'babies' who lays a very nice and shiny chocolate coloured egg. But all the eggs have one thing in common, the yolks are truly orange, a deep orange. The colour comes from the green feed in the diet - grass. True free range (its now getting the label 'pastured') egg yolks are nothing like some of the eggs sold as 'free range' in supermarkets, which is basically just hens in sheds but not in small cages. There is nothing 'free' about this. Its worth paying a little extra for the 'real deal' than to buy cheap eggs that encourage farmers to treat these lovely animals in such a disgraceful way. 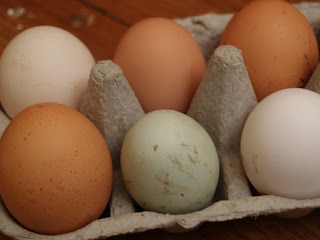 Lovely color to your eggs! ....and yes...raising chickens is hard work and not really a savings, but soooo worth it. Happy Chickens make healthy eggs!